Published 1990 by Smithsonian Folkways Recordings. I produced this album while working as an archivist at the Smithsonian Office of Folklife Programs (since renamed a couple of times), which included the historical Folkways collection and the contemporary Smithsonian Folkways label. Much of the research was based on my Master’s thesis, The Politicized American Legend of the Singing Hero: Joe Hill, Woody Guthrie, Pete Seeger, Bob Dylan, and Bruce Springsteen (The George Washington University, 1990). Since the album was published in 1990, the references reflect that time period. That was also the year of the 75th anniversary of Joe Hill’s death. I was a member of the Joe Hill Organizing Committee, organizing anniversary events in Utah. I travelled to labor events around the U.S. to promote the album, to talk about Joe Hill, and to sing songs with my Fellow Workers. The following liner notes are my extended version not published with the recording. I published a few dozen copies of the extended notes—22 pages with a bright red cover—and I hear they are now a collectors’ item. Click on the song names to read extended notes by song. See updates for additions to the original. Joe Hill (1879 – 1915) was a labor organizer and songwriter for the Industrial Workers of the World (I.W.W.). His songs describe labor struggles with strikebreaking (“Casey Jones—The Union Scab”), the plight of the homeless and unemployed (“The Tramp”), the economic base of prostitution (“The White Slave”). 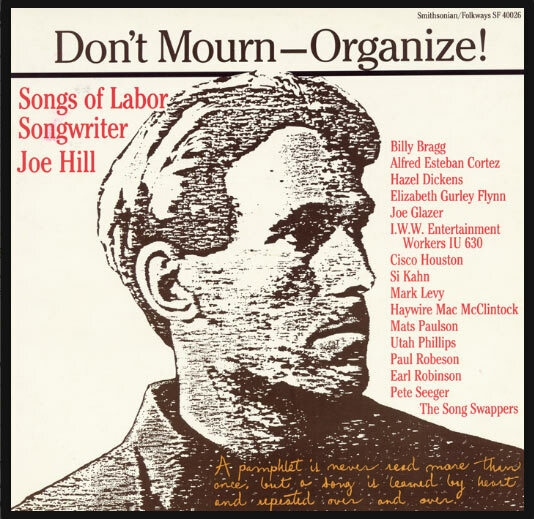 His execution for murder in Utah on 19 November 1915 raise Joe Hill to powerful symbolic status within the labor movement, and many songs and poems were subsequently written about him (“Joe Hill,” “Joe Hill’s Ashes,” “Joe Hill Listens to the Praying”) by other songwriters and authors. Both as a songwriter and as a subject of songs, Joe Hill continues to be an important figure in United States labor history. The songs, poems, and speeches on this album were written between 1911 and 1989; the performances were recorded between 1941 and 1990. There is a dramatic mix of styles and performance contexts, from an early studio recording of a popular song (“Joe Hill,” Earl Robinson) to an outdoor festival recitation (“Joe Hill’s Last Will,” Utah Phillips) to a college lecture (narrative, Elizabeth Gurley Flynn) to a live concert (“Paper Heart,” Si Kahn) to a contemporary studio recording (“Joe Hill,” Billy Bragg). When asked “Did you know Joe Hill?” Mac McClintock replied, “Yeah, I knew him well—as well as anybody could be said to know him.” When you have listened to this record, you will know Joe Hill, or at least what he has become. Getting to know Joe Hill is a step in acknowledging our cultural forebears. For many performers—including those appearing on this album—learning and perpetuating stories and songs of Joe Hill is a kind of rite of passage. Now, 75 years after his death, the name Joe Hill is not known as widely as his influence is felt. Joe Hill is a model and an inspiration for those who still work to organize through music. When asked, “Did you know Joe Hill?” Mac McClintock replied “Yeah, I knew him well—as well as anybody could be said to know him.” When you have listen to this record, you will know Joe Hill—or at least what he has become. Getting to know him is a step in acknowledging our cultural forebears. For many performers—including some of those appearing on this album—learning and perpetuating stories and songs of Joe Hill is a rite of passage. “A pamphlet, no matter how good, is never read more than once, but a song is learned by heart and repeated over and over; and I maintain that if a person can put a few cold, common sense facts into a song, and dress them up in a cloak of humor to take the dryness off of them, he will succeed in reaching a great number of workers who are too unintelligent or too indifferent to read a pamphlet or an editorial on economic science. “There is one thing that is necessary in order to hold the old members and to get the would-be members interested in the class struggle and that is entertainment” (29 November 1914). Utah authorities arrested Joe Hill in 1914 for the murder of a grocery store owner John Morrison and his son Arling. He was tried and convicted on less than convincing evidence. His supporters considered the charges a class-oriented conspiracy to quiet an instrument of the growing union. The case had already attracted widespread publicity while Joe Hill waiting in jail for the justice he expected, but after he was executed 19 November 1915 it attained a powerful symbolic status within the labor movement. Thirty thousand mourners wearing crimson and singing songs of battle attended his funeral. The day after Joe Hill’s death, one journalist wondered whether his martyrdom might not “make Hillstrom dead much more dangerous to social stability than he was when alive” (New York Times, 20 November 1915). The point was insightful. The I.W.W. certainly used the indignity of Joe Hill’s death to rally members. Now, after 75 years, the name Joe Hill is not known as widely as his influence is felt. Joe Hill is a model and an inspiration for those who still work to organize through music. The day before his execution, Joe Hill wrote to Wobbly leader Big Bill Haywood, “Don’t waste any time mourning—organize!” Tradition has shortened his request to “Don’t Mourn—Organize!” It is, though, precisely through the rituals of mourning and commemoration that singers, speakers, and artists have organized their audiences. Performers participate in a dynamic musical and political tradition by perpetuating Joe Hill’s ideals and following his example. The songs, the images, the legends and memories of Joe Hill—and other songwriters within this tradition—are used to forge a sense of community. Singers often repeat stories about Joe Hill to provide a framework for their own performances. These stories are spread through songs and narratives, circulated by means of live performances, or films and recordings, or books and articles. Whatever the medium, those works educate the listener and convey the performers’ respect and affection for their heroes; a spirit of solidarity is engendered among those who participate, sharing knowledge and singing together. The songwriters who followed Joe Hill are links on a chain of political music, as Pete Seeger wrote in his autobiography (The Incompleat Folksinger. New York: Simon and Schuster, 1972): Woody Guthrie wrote “Joe Hillstrom”; Bob Dylan wrote “Song for Woody”; Phil Ochs wrote “Bound for Glory” (about Woody Guthrie) and “Joe Hill” (to the traditional tune Woody Guthrie borrowed for his “Tom Joad”); and Billy Bragg wrote “Phil Ochs” (based on a song about Joe Hill). Songs and stories by performers about their heroes continue to link musical and political traditions among musicians including those above, Pete Seeger, Si Kahn, Hazel Dickens, Utah Phillips, and many others. Joe Hill alone does not bring together the artists assembled in this collection. Any strong image—an engaging life story such as Joe Hill’s or a moving event like his death by firing squad—can be the occasion for people with similar concerns to shared ideas expressed in song, theater, or works of art. The lives of the songwriters and performers represented here are intertwined not just in musical influences but in social, musical and other activities. These artists travel in and out of common concern for workers’ rights, love of music, and oftentimes stories and songs of Joe Hill. Bird, Stewart, Dan Georgakas, and Deborah Shaffer, editors. Solidarity Forever: An Oral History of the I.W.W. Chicago: Lake View Press, 1985. Foner, Philips S. The Letters of Joe Hill. New York: Oak Publications, 1965. Glazer, Joe. Songs of Joe Hill. Folkways FA 2039. Hampton, Wayne. Guerilla Minstrels: John Lennon, Joe Hill, Woody Guthrie, Bob Dylan. Knoxville: University of Tennessee Press, 1986. Kornbluh, Joyce L., editor. Rebel Voices: An I.W.W. Anthology. Ann Arbor: University of Michigan Press, 1964. Paulson, Mats. Songs and Letters of Joe Hill. Sonet SLP 20.